A savory winter dish with sun-dried tomatoes, fried sage and roasted butternut squash sauce. Toss together the butternut squash, rosemary, olive oil, salt and pepper in a large bowl. Place on a sheet tray and roast for 15-20 minutes at 375°F or until all pieces have softened. Transfer the cooked squash to a blender and purée together with the white wine. Combine the butternut squash purée and prepared LeGoût® Cream Soup Base in a pot over medium heat, whisking constantly, until the sauce comes to a simmer. 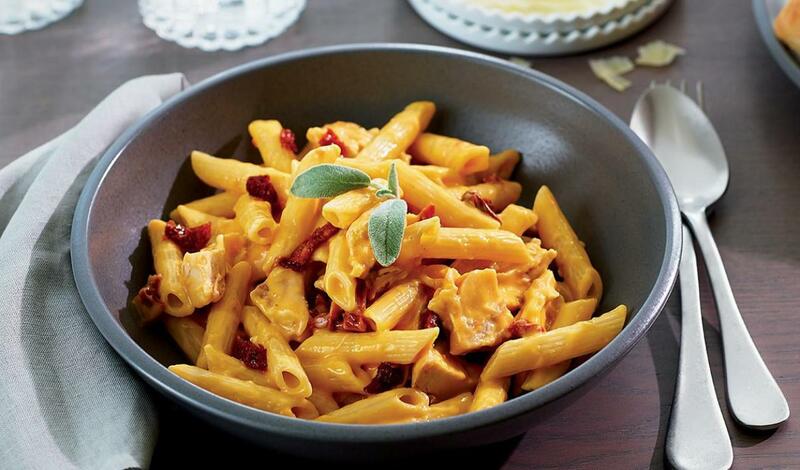 Combine cooked pasta, prepared Butternut Squash Sauce, pulled chicken, and sun-dried tomatoes. Cook over medium heat until all ingredients are warmed through. Lightly grate nutmeg over the pasta, and top with parmesan cheese, and fried sage leaves.